I have discussed previously on this blog how many different ways you can add stability to a shoe. This goes beyond the traditional methods of utilizing second density foam or posting more commonly on the medial side of the shoe (there are very few shoes that have lateral posting, namely the New Balance 990 series and in a minor fashion the Brooks Asteria). Stability can come from many different footwear factors: firmness, sole width, heel counters, posterior lateral heel bevel and more. What I want to discuss today is medial and lateral sole flare. This is defined as the protrusion laterally or medially of the sole beyond the upper. This can happen at any point along the sole of the shoe. 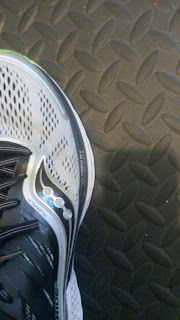 What this is supposed to accomplish is by extending the midsole beyond the upper, there is more material to resist the roll of the foot in that direction. I have discussed an aspect of this previously in regards to posterior heel flare (LINK) and some degree of the physics behind this are similar. However, the lateral and medial sole flare influence on the frontal plane mechanics have more variability depending on placement. Flare can be placed at any point along the medial or lateral sides of the sole. When placed in the heel, it serves to moderate pronation or supination depending on the side. Medial sole flare in the heel is generally utilized for pronation. Given that there is extra material on the medial side of the foot, there is more resistance to the inward roll of the foot. For those that tend to pronate more immediately at the heel or have excessive calcaneal eversion, medial heel flare is a good way to stabilize upon initial contact. 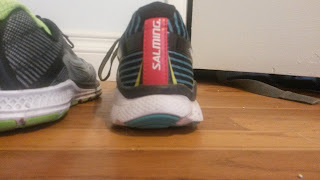 For those that collapse more at the midfoot, this can provide minor resistance, but midfoot posting or a wider sole will likely do a better job. Lateral sole flare in the heel is one of the few ways to resist supination at heel contact. Supination generally involves the laterally directed roll of the foot upon contact and loading response. Like medial sole flare, lateral sole flare creates more material on outside of the shoe that serves to resist the outward role of the foot. 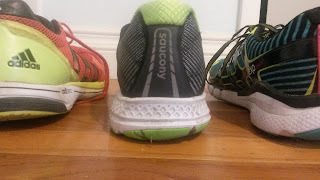 With the exceptions of the shoes mentioned above, there are not really any running shoes specifically made for excessive supination of the foot. This may be due to the fact that supination tends to be a much more rare biomechanical feature. A great many individuals assume they supinate, but what usually happens is that they land in an inverted foot position causing them to land on the outside of their foot and then they pronate (which is fairly normal). 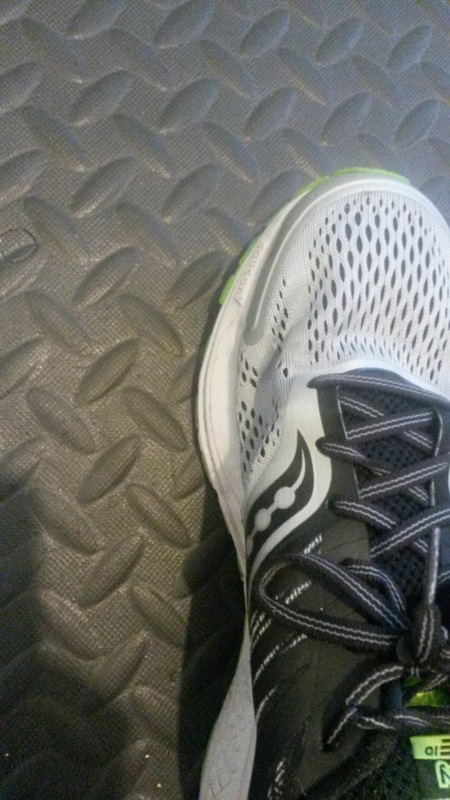 Just because you wear out the lateral side of you shoe does not necessarily mean you supinate. Supination is named for actual ankle motion, not shoe wear, which is poorly correlated with little to no research on outsole wear patterns. Given that it is rare to find actual second density foam or posting for supination, lateral sole flare tends to be a more common shoe feature that can help with this. However, individuals that land laterally and pronate naturally need to be careful of excessive lateral heel flare. The reason being is that lateral heel flare with normal mechanics causes an early initial contact with normal landing in a slightly inverted foot position. It is normal to land at the posterior lateral heel (not the posterior medial). Early initial contact however is not good because your muscles are not ready to absorb impact and it increases amount of distance your foot has to pronate. So for those with posterior tibialis issues, lateral heel flare is something to avoid because it means the posterior tibialis has to work over a greater distance AND you land when your muscles are not ready to absorb shock. Your muscles should optimally be activated before you land to prepare for shock absorption. An early contact means they are not fully ready and thus your shock absorption has to be compensated for (usually by joint loading). Given that most shoes with sole flare tend to have it both medially and laterally, you may have one side you need and another you don't. As I always tell my patients, don't be afraid to edit your shoes. If it is really necessary, find a shoe with a certain flare and carefully shave down the side you do not need to a more straight edge. I would not suggest doing this on a new pair of shoes, but try it on some older pairs first for practice and comparison. For those with general instability, bilateral flare may help but most would benefit more from internal stabilization (straps, tape, orthotics, etc). Zoomed out comparison (harder to see from afar). Stability features in the forefoot are rare. 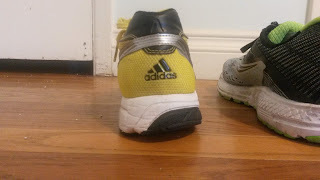 The current iterations of the the Adidas Tempo Boost are one of the few shoes with forefoot based posting. The Nike Odyssey has full length posting that includes the forefoot. However posting up that far is not common. Forefoot sole flare is a bit more common and Saucony is one company that tends to do this frequently. Like the heel, the forefoot of a shoe can have lateral, medial or both kinds of flare. Forefoot lateral flare generally resists excessive late stage supination or more accurately excessive forefoot inversion at late stance phase. Excessive inversion of the forefoot at late stance or toe off may cause excessive loading of 4th and 5th metatarsals and usually I find there is weakness of the fibularis longus. Weakness of this muscle causes an inability to hold 1st metatarsal down and propel off of it, so people avoid loading it. Your big toe joint is a very important place for you to lever off of during toe off. It generally is a much more robust joint that can take a great deal of force if applied in the correct plane of motion (sagittal). The 4th and 5th metatarsals are not so tough and given the lack of muscular stabilization at those joints means you are either setting yourself up to overuse the lateral structures of the foot, waste energy as you cannot propel yourself as well off these joints or potentially place yourself at risk for stress fractures (that last one is anecdotal. I do not have a study to cite on that). For those that forefoot strike on the lateral edge of the forefoot, forefoot flare may not be a good thing. Similar to the lateral heel flare, lateral forefoot flare can cause early initial contact during a forefoot strike. Early initial contact is again not usually a good thing because you are hitting the ground before your muscles and body are ready to properly absorb force. This can lead to excessive joint loading and a little extra muscle strain potentially in the peroneus longus or posterior tibialis, as both have a longer direction to fall and attempt to eccentrically control. Most individuals however wear this down fairly quickly in shoes with minor forefoot flare and then don't notice it. For shoes with a great deal of lateral forefoot flare, many forefoot strikers need to be wary or at least understand why they may or may not be having some initial discomfort (sometimes iliotibial band issues from my experience with a few patients). Some people may never have a problem however and it depends on the resiliency of the person. Forefoot medial flare is a favorite of mine as it tends to resist forefoot pronation or collapse. Rolling off a collapsed first ray is not a good thing. That is normally where you can pivot and power off as long as you have strong calves to propel you forward, a strong fibularis longus to hold the first metarasophalangeal joint down and decent abductor hallucis strength to keep the first toe straight. Collapse of the forefoot or more accurately the transverse metatarsal arch (yes, you have three arches in the foot) is not good in general. As pronation is actually three motions (dorsiflexion, abduction, eversion), as the forefoot everts, this places the medial aspect of the first metatarsophalangeal joint on the ground. Add abduction to that and you have further pressure on that medial side. Rolling or toeing off that point over years can cause the bone to respond to those abnormal forces and grow out to resist them. That and this force pushes the 1st toe laterally, lengthening out the abductor hallucis muscle (a very interesting muscle that is commonly weak, but is one of the many important medial longitudinal arch muscles). This weakness along with the above are what can contribute to the formation of bunions (excessive pressure on the medial aspect of that joint and pushing the big toe lateral... sounds familiar?). So that medial support in the forefoot sounds pretty good right? Always my big question as to why that is so rare in footwear when bunions and collapsed forefoot or transverse metatarsal arches are so common. In terms of footwear prescription, people collapse in far more places than traditional posting takes into account. So if you are one of those lucky ones, this guide may help you find a shoe that does this. If you supinate excessively at the heel, look for a shoe with lateral heel flare (not posterior lateral if possible). If you pronate excessively at the heel (rather than the midfoot from calcaneal mobility), look for medial heel flare. 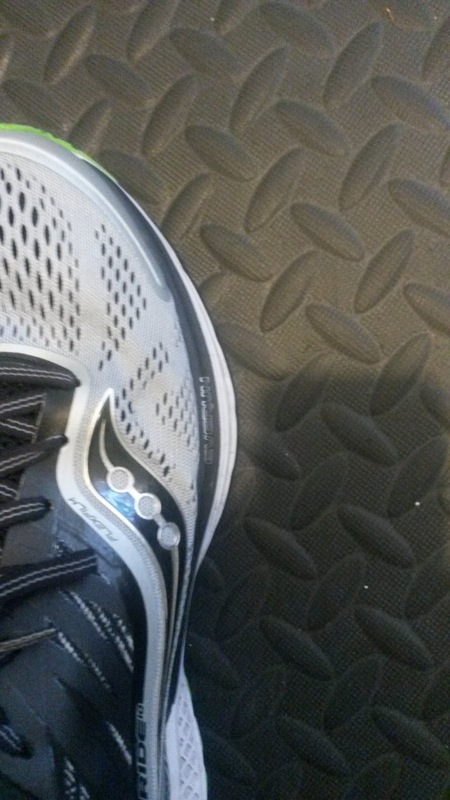 If you pronate at the forefoot, find a shoe with medial forefoot flare (Saucony commonly does this). If you supinate excessively at the forefoot, find a shoe with lateral forefoot flare. These do not have to be extreme as I have found subtle changes generally cause fewer issues than extreme ones. The current paradigm of stability shoes needs to be changed. As I have said previously, there are many different ways to create or find stability in a shoe. 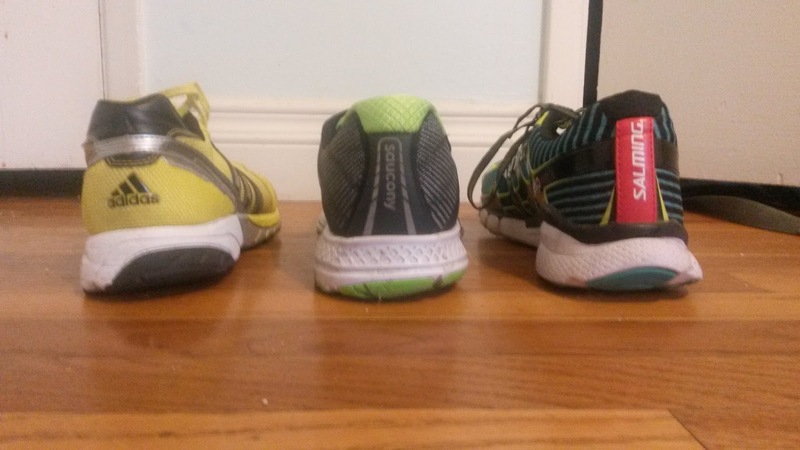 For those with more interesting issues, hopefully this post serves as a guide to help you find a shoe that better suits your stability needs. As always, your number one priority should be strengthening, stability and mobility work of your own body before looking at a shoe, but footwear definitely plays a large roll and is very important to consider.